I’ve been Consecutive Number Plate Spotting now for 1 year, and have found 260 plates, so a quick bit of maths say another 3 years to go! This is mainly a question for Will, but others feel free to comment. We are currently in Italy on a lovely weeks holiday, safe in the knowledge that finding a UK number plate was almost impossible. 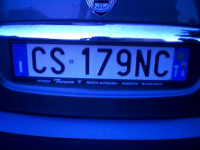 However as the picture shows, the Italians have CNPS style plates. So do we count any plates found in Italy, or wait until we come home to carry on? This time last week, spotting number plates seemed simple, getting at least one a day, everything was going fine. On the way to work trying to find a 136, I saw two sets of consecutive 137 & 138, and driving a 139, I was sure that I would be looking for a 140 in no time. Still no luck at lunch time, and then on the way home, I saw another 137 driving past me. Then, 20 seconds later a 136! This was going to be easy. I had seen at least 5 different 137s in the last two day. OK they were all moving, but they were all in the area. But no, ten 138s later, I finally find the 137 a week later. Luckily for me, a 138 then appeared within a few minutes. Next job was to safely pull over, spot my number plate before a 140 appeared. No 140 did appear, nor have I found one yet, but hopefully I’ll find one soon, and my ratio of 0.6318 won’t drop any lower. I have now discovered that trying to play CNPS in Hemel Hempstead is almost useless, whilst I can see a number 67 everyday, there just doesn’t seem to be the large quantity of valid cars, like Lincoln. I have now been stuck on 27 for ages. Therefore if anybody knows of a legal number plate which lives nearby them, and is no further than 100 miles from Hemel Hempstead, I will offer to buy them drinks, on the successful completion of me spotting it. Leave details in the comments box. Having got stuck on 17 for a few days, I was getting rather worried that I might not find one. Other plates were mocking me. I saw two number 20’s passing each other, an 18 in the Sainsburys car park, a 19 on the route home. Then walking back to Westminster Tube, I saw a several 18, all teasing me, but just as I crossed the lights at Bridge Street, then I saw it, the 17 I was looking for. I almost missed it, because the checky devils had arranged it like H1 7ABC (letters have been changed), then as I looked across the road, one of the 18’s went passed me again, but this time I could count it. Two in two seconds, I was back on track. Then on the way home I tried my luck with the 19 I had seen parked up on someones driveway. And yes, it was there too. 3 in one hour! After my slow start, I getting my plates/day ratio towards the 1 mark. I have now created my CNPS tracker site. In theory it is possible to let other people use my server/db to create their own tracker page. If you would like one, beg nicely. I’ve also added a small tracker to the sidebar, so you can check my progress. Having seen a post on Will’s Blog, a few weeks ago I decided to give it ago. Once I can be bother to get motivated again, I’ll create a lovely webpage to record my progress (as www.cnps.org.uk is rubbish). I am currently on 5 (having been stuck on 4 for a while). Word of warning, try not to play on the M11 (whilst driving) at 10pm on a Sunday, it’s too dark!